A round of thunderstorms (some possibly severe) is forecast overnight Wednesday through Thursday Morning in SE Texas. After that, super weather returns to the area Friday and this weekend with dry weather persisting through Monday. A few showers possible next Tuesday. 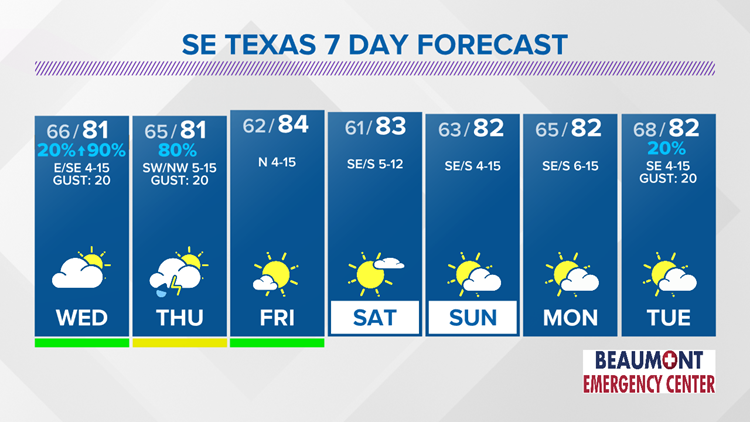 A round of stormy weather is forecast overnight Wednesday into Thursday Morning, but this will then bring another outstanding weekend weather wise in SE Texas. Tonight, a moist, southerly flow off the gulf will continue to bring cloudiness and higher humidity to the area. This will keep skies mostly cloudy with lows in the middle 60’s. Wednesday, mostly cloudy skies are forecast with most of the rain holding off with just a 20% coverage of showers forecast. High temperatures will be in the upper 70’s to around 80. After midnight Wednesday into Thursday Morning, a line of thunderstorms (some possibly severe with damaging winds and damaging winds is possible.) There’s a Slight Risk of severe weather for SE Texas. The line is expected to move out of the area roughly around noon with decreasing afternoon cloudiness possible. Friday, Saturday, Sunday and Monday will be rain-free across SE Texas. Abundant sunshine, cool mornings and warm afternoons are forecast. Next Tuesday, skies will begin clouding up again with a slight chance of showers in the forecast. Triangle Tonight: Mostly cloudy, warmer. Low near 66° in Beaumont, 65° Orange and 67° at Port Arthur. Winds: Southeast becoming East 3-12 mph. Lakes Area Tonight: Mostly cloudy, warmer. Low near: 63°. Winds: Southeast 2-7 mph. Triangle Wednesday: Mostly cloudy, warm, humid and breezy with a 20% coverage of afternoon showers. High near: 81° in Beaumont, near 79° in Orange and near 80° in Port Arthur. Winds: East becoming Southeast 4-15 mph with gusts to 20 mph. Lakes Area Wednesday: Mostly cloudy, warm and humid with a 20% coverage of afternoon showers. High near: 79°. Winds: Southeast becoming South 3-12 mph. Thursday (4/25): 80% coverage of mainly morning showers and thunderstorms (Slight Risk of severe weather with damaging winds and damaging hail possible), then decreasing afternoon cloudiness. Low near: 65°. High near: 81°. Winds: Southwest shifting Northwest 5-1 mph with gusts to 20 mph. Friday (4/26): AM clouds becoming sunny, warm and dry with lower humidity. Low near: 62. High near 84°. Winds: North 4-15 mph. Saturday (4/27): Mostly sunny and dry. Low near: 61°. High near: 83°. Winds: Southeast becoming South 5-12 mph. Sunday (4/28): Mostly sunny to partly cloudy, mild and dry. Low near: 63°. High near: 82°. Winds: Southeast becoming South 4-15 mph. Monday (4/29): Partly sunny, warm and breezy. Low near: 65°. High near: 82°. Winds: Southeast becoming South 6-15 mph. Tuesday (4/30): Mostly cloudy in the morning becoming mostly sunny during the afternoon. Warm, humid, breezy with a 20% coverage of showers. Low near: 68°. High near: 82°. Winds: Southeast 4-15 mph with gusts to 20 mph.